Open a drawing that contains some block definitions you’d like to combine, or draw some simple geometry to make some similar types of objects. You can create dynamic blocks from scratch, or you can work with existing standard (nondynamic) block definitions. On the Block panel of the Home tab, choose Block Editor to open the Edit Block Definition dialog box. In the Block to Create or Edit box, specify a new block name or select Current Drawing; then click OK to display the Block Editor window. The Block Editor is a special authoring environment with its own Ribbon tab plus a passel of command-line commands. You also have access to the rest of the Ribbon tabs, so you can draw and edit just like you would in the regular drawing window. The background color is different from the drawing editor’s background color to help you remember where you are. 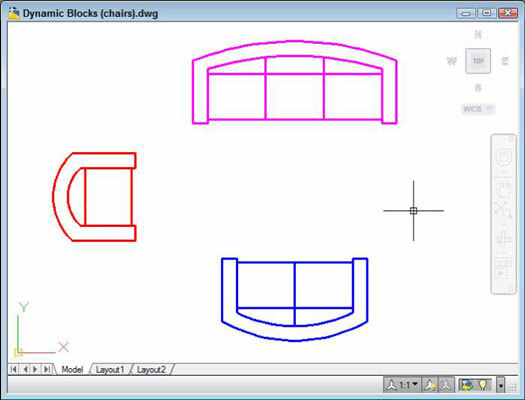 The Block Editor tab’s Geometric, Dimensional, and Manage panels are elements of the AutoCAD parametric drawing feature. The concepts are pretty similar to adding parametric features to dynamic blocks. If you enter a new block name, AutoCAD displays an empty block-authoring environment where you draw geometry or insert existing blocks. If you instead select Current Drawing, AutoCAD places all drawing objects inside the block-authoring environment. Create some geometry for the first visibility state. Alternatively, click the Home tab, choose Insert on the Block panel, and select an existing block definition to serve as the first visibility state. When creating geometry from scratch, pay attention to where the common base point should be. Although you use different blocks to assemble a multiple-view block, they should all have the same base point. (0,0 or the exact center are good ones for blocks.) You don’t want your chairs jumping around between different insertion points! If you inserted an existing block in Step 4, deselect all three Specify On-Screen check boxes, make sure that the Explode check box is not selected, and then click OK.
Repeat Steps 4 and 5, drawing or inserting all the necessary geometry. At this point, your drawing screen may look pretty strange. Don’t worry; you’re going to fix it in the next steps. Click the Parameters tab of the Block Authoring Palettes and then click Visibility. If the palettes aren’t open, click Authoring Palettes on the Manage panel on the highlighted Block Editor contextual tab of the Ribbon. AutoCAD prompts you to specify the parameter location. Click to place the parameter marker somewhere other than the base point location you chose in Step 4. AutoCAD places a parameter marker at the selected point and returns to the command line. The label Visibility1 appears next to the Visibility Parameter marker, and a yellow Alert symbol indicates that no action has been assigned to the parameter yet. The controls on the Ribbon’s Visibility panel become active. The parameter location that you specify will be the spot on the block where the dynamic block option grip will be displayed. It’s not crucial where you locate this point, but try to pick a sensible location on the object. If you specify the same point for the parameter location as the base point for the block, you may have a hard time selecting the dynamic option grip. Click Visibility States on the Visibility panel. Click Rename and change VisibilityState0 to something more descriptive. Then click OK.
As is the case with other named objects in AutoCAD, best practice is to assign useful, descriptive names rather than accept the default generic labels. On the Visibility panel, click the Make Invisible button. At the Select Objects prompt, select the geometry or block inserts that should be invisible in the current visibility state — that is, those that are not associated with the current visibility state — and then press Enter. Click Visibility States again and then click New to create a new visibility state. In the New Visibility State dialog box, enter a descriptive name. Also select the Show All Existing Objects in New State option and then click OK.
All your geometry should reappear. Repeat Steps 9 and 10 to create additional visibility states associated with the remaining geometry or blocks. 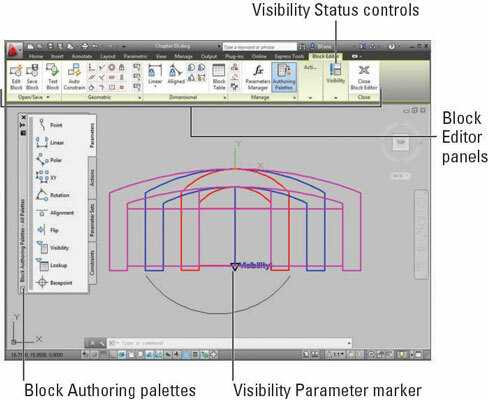 The geometry or block insert associated with the last created visibility state should be visible onscreen. Click OK to close the Visibility States dialog box and then click Close Block Editor on the Ribbon. Save the changes to your new block or to Current Drawing. Cancel: Click Cancel to return to the Block Editor without saving your changes. Discard changes: Clicking Discard the Changes closes the Block Editor without saving your changes. Save: Click Save the Changes to update the block and exit. AutoCAD closes the block-authoring environment and returns to the standard drawing editor window. The Block Editor tab includes a Test Block tool you can use to see what your finished product will look like without the hassle of closing the editor and inserting or manipulating the block inside the drawing editor. Test Block displays the geometry and lets you try different parameters; then you can easily return to the Block Editor to tweak your masterpiece. You’ll find the Test Block button on the Open/Save panel of the Block Editor contextual tab.